As many as 100 teachers of early Childhood Education Center (PAUD) in South Jakarta participated in scholarship program. The program was held by South Jakarta Administration cooperating with STIT Insida Bulungan, South Jakarta. Budget amounted to Rp 400 million have been prepared from South Jakarta Muslim Charity Collection Board (Bazis).
" We're cooperating with the Family Welfare Movement (TP PKK) for selecting the teachers from PKK members at sub-district and urban village levels"
"We're cooperating with the Family Welfare Movement (TP PKK) for selecting the teachers from PKK members at sub-district and urban village levels," said Head of South Jakarta Bazis, Sutriana Lela, Tuesday (5/5). 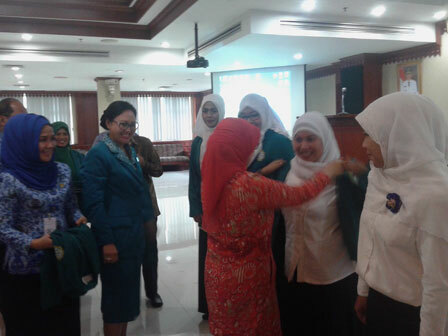 Through the program, she added, it would be a modal for teachers become quality educator. Tri Wahyuningsih, one of PAUD teacher representatives from Tebet Sub-District claimed she was proud participating in the program. "Here, there are 14 teacher representatives are glad. Whereas, we've had 40 years old but still get a school scholarship again," she expressed.